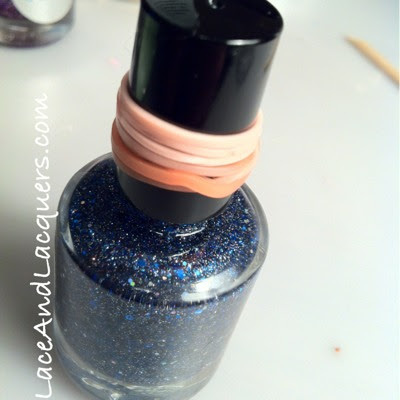 Lace and Lacquers: How to removed a stuck nail polish cap! Pin It Someone asked me if this was on my blog! I posted it to Facebook but I decided to post here since not everyone likes my Facebook page and not everyone follows me on Blogspot! I've done this for years and decided to share when my cap got stuck today. Just take a rubber band (this is a silly band lmao) and wrap it right around the cap so it won't slip. And then open the bottle! Wallah! Hasn't failed me yet! Yes, this is the perfect way to get a stuck bottle unstuck!! If it's being super stubborn, I will fill a shot glass with hot water and put the bottle in (upside down, of course) for a minute or so and that will help too! Great tip. I feel so bad using my teeth as a vice cuz then I get teethmarks on the brush. :/ Now I don't have to!